I’m going to try and keep this short. 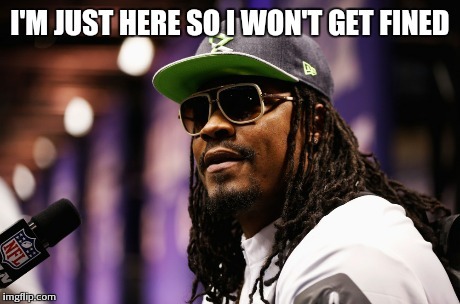 I love Marshawn Lynch. Period. AND still, I am #TeamLynch (an unfortunate last name if you are steeped in American history but I digress). I got wind of him last year after I started paying attention to Richard Sherman (another Seahawks player I adore!) and was intrigued by his refusal to speak to the media. Who is this man who told the machine “nah I’m good”?? Who is this man who said “I say what I need to say on the field”? This is me paraphrasing by the way but knowing what we know about Mr. Lynch he totally could have made both statements. But seriously, I was genuinely curious about him, his background and his stance on the media. In this era where EVERYONE maintains a social media presence, where people deliberately seek out media attention, where your job has made it a requirement that you make yourself available to the media – who was this person who said “no”? And why? He’s had a few troubles. He also regularly and happily gives back to his community. Regarding the “why” part. What’s funny is that I kinda almost didn’t (and still don’t) care. I appreciate him taking a stand. I appreciate him exerting control over his person. He executes flawlessly while at work. When work is over, he’s not interested in talking about it with people he doesn’t know very well. Donovan McNabb pointed out that quarterbacks, as leaders of the team, do have an obligation to the speak to the media and Russell Wilson does just that. I would also add that it’s not as though Seattle is lacking in mouth pieces (Richard Sherman…) so why the backlash? This reporter’s assessment that Lynch’s refusal to “chit chat” with the media is a result of limited intelligence is (a) racist and more important (b) indicative of his own ill functioning brain cells. “I’ve never seen anybody win the game in the media. But at the same time, I understand what it could do for you, if you wanted to be someone who talks a lot. But that’s not me. “And I’m not as comfortable, especially at the position I play, making it about me. As a running back, it takes five offensive linemen, a tight end, a fullback and possibly two wide receivers, in order to make my job successful. But when I do interviews, most of the time it’ll come back to me. There are only so many times I can say, ‘I owe it to my offensive linemen,’ or, ‘The credit should go to my teammates,’ before it becomes run down. “This goes back even to Pop Warner. You’d have a good game and they’d want you to give a couple of quotes for the newspaper, and I would let my other teammates be the ones to talk. That’s how it was in high school, too. At Cal, I’d have my cousin, Robert Jordan, and Justin Forsett do it.